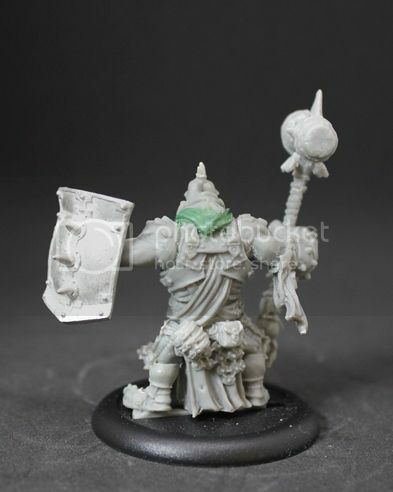 Lost In The Warp: Warders Week - Trollblood Warders Day 1 - Shield Guard to the face anyone? Warders Week - Trollblood Warders Day 1 - Shield Guard to the face anyone? So I have started up a Trollblood force for Hordes. I have always loved the models and was planning on doing just a small force for play at my club, but my friend Erik also wanted to start Trolls SO we are sort of sharing an army now! Not quite sure the logistics of this over the long run but hey he is one of my best friends, we both have other armies and we will just have to coordinate well when it comes to tournaments! Cool Beans. It is no secret that up until now Mercenaries have been my bread and butter in the Warmachine world with the HorgenHold Forge Guard being my absolute favorite unit in the game. With their big hammers, reach, weapon master and hard armour, they have won me more battles than anything else (probably more than everything else combined to be honest) and they just look cool. Warders. Trolls with BIG hammers, reach, weapon master, tough and 8 WOUNDS. There was little doubt that I would want a unit (or two) of these bad boys that are so intrinsically similar to my favorite existing unit. And then I opened the box. 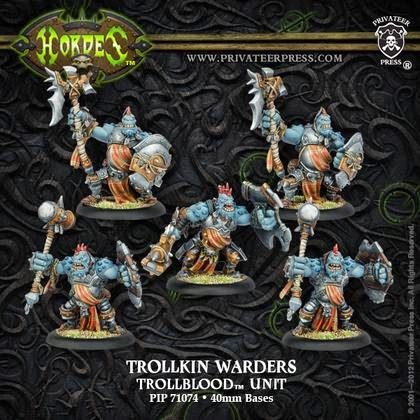 These models are well known for being some of the worst casts in the PP Trollbloods range. The sculpting is lovely but the mold lines are horrendous - plentiful, placed in tough spots, a total beast to remove without damaging the model. It takes me approximately 2 hours just to prep each of these models to my tabletop (not competition perfect) level. I would be surprised to ever see these in top tier painting competition simply because of the issues in prepping the models themselves. REALLY minor conversion work this time around - probably should have started this whole thing with a slightly more interesting one but meh! I swapped the shield for the one from the Ogrun Bokur. Proportionately it fits in well and I like the way the spikes echo the spiky Mohawk. I gave him a little bit of battle scarring on his face and equipment and edited the positioning of the arm slightly. Finally I filled in the weird gap at the back of the neck by giving him a hood. 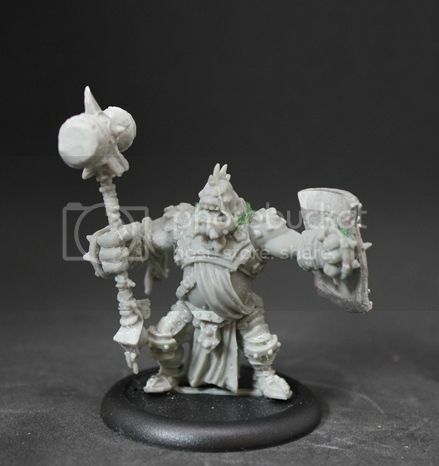 I think this will also tie him in to several of the other models in the range including the stone crew, the highwaymen and Jarl (my favorite caster thus far - and one the warders will definitely see play with). I will probably continue to add these on many of the figures I do. See ya tomorrow with another warder - I think I will do the somewhat more dramatic Unit Leader next!